This Ceylon Cinnamon Cashew milk is packed with an incredible dose of vital minerals, protein and healthy saturated fats. Serve iced with Ceylon Cinnamon powder sprinkled on top as a garnish. This is the perfect Keto friendly drink. For diabetics the ingredients in cashew is one powerful drink with a healthy dose of Magnesium and Manganese both of which aid in controlling bloody sugar levels. But the incredible power of cashew extends to bone health, ageing, inflammation and pain, brain function and much more. Soak 1 cup of raw cashew nuts in 2 cups of water, overnight in the refrigerator. After the overnight soaking, rinse the soaked cashew nuts in cold water for 30 seconds. Blend on your liquefy settings of your blender for 1 minute. You only add 1 tablespoon of water at this stage so the cashew will become a nice smooth paste. After two minutes add 1 cup of water and blend more. After three minutes add 1 more cup of water and blend again. After four minutes add the rest of water and blend for another minute. 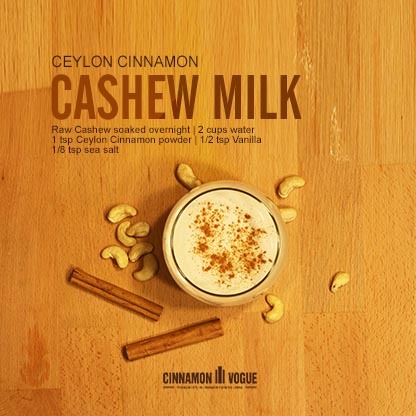 Pour the cashew milk into a glass, add a dash of crushed ice and sprinkle some Ceylon cinnamon powder and serve. Optionally you can garnish wish a dash of Cinnamon Syrup as we show you here. At first you get shocked that cashews have 19% total fat. Dig deeper and you see 11% is saturated fats which are apparently good for you. But what is interesting is that cashews have incredibly healthy levels of Copper, Magnesium and Manganese and even protein. No wonder cashews are expensive. That means 1-2 cups of cashew milk per week would be a great addition to your health regimen. Remember don't over do even a good thing. Unlike ordinary Cassia Cinnamon you find in the stores, Ceylon Cinnamon has low Coumarin levels, so it won't damage your liver, especially if you are a regular Cinnamon tea drinker. Besides Ceylon Cinnamon is mild, yet slightly sweeter. It's not spicy like store bought Cassia Cinnamon, but has hints of cloves and citrus with wonderful subtle aroma.